Kasumi Ninja is a 1994 one-on-one fighting game developed by Hand Made Software and published by Atari Corporation for the Atari Jaguar. It is an original fighting game that was released for the Jaguar home console system, with other games being Ultra Vortek, Primal Rage, and Fight for Life, and sought to capitalize on the success of ultra violent fighting games started by Midway's Mortal Kombat. The game features a large number of dynamic, three-dimensional battlegrounds using parallax scrolling technology. In single mode, the player is initially only able to choose between two characters (Habaki and Senzo). Other characters are unlocked progressively at the successful completion of each stage. The game is named after the game's setting, a mystical island called Kasumi Island. The objective of the game was to kill the game's boss, Gyaku, in his true form: a demon. Only when Demon Gyaku was killed one gets the best ending. Controls feature punch, kick, and special move buttons.The two player versus mode requires the use of a code for players to choose the same character. The game was given a "Mature" (17+) rating by the Entertainment Software Rating Board for its graphic violence and gore. 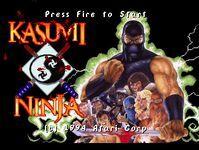 Kasumi Ninja was one of the first video games in history to allow parents to censor the level of violence allowed in the game by using a six digit password (by using the Jaguar's 12 button keypad). When the parental lock is enabled, a code is needed to select the "Gore Fest" gore level. The possible gore levels are: None (no blood), Combat (small amount of blood, but none from swords), Disturbing (more blood than Combat, and blood dripping from the swords), and Gore Fest (the only mode with death moves, the most blood, and it has to be unlocked with a parental lockout code)." Source: Wikipedia, "http://en.wikipedia.org/wiki/Kasumi_Ninja," available under the CC-BY-SA License.